Dining Table: 52″ Round x 30.5″ Height, Table has 2″ Umbrella Hole in the center. Dining Arm Chair:25″ W x 21″ L x 34″ H, Fully Assembled, stackable for easy storage. 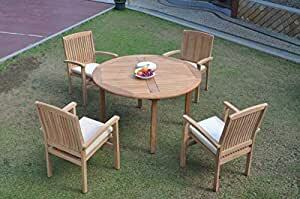 Set includes: 52″ Round Table and 4 Wave Stacking Arm Chairs. Pictures shown with more chairs is for illustration purpose only. You will receive only 4 chairs. ** Wood Umbrella Hole Plug is also provided. ** 2″ Umbrella Hole is available in the middle of the table. ** Umbrella is not included with the set, but can be purchase separately, please inquire. ** DON’T FORGET TO ENQUIRE ABOUT OUR SUNBRELLA CUSHIONS (SOLD SEPARATELY) ** If you need more chairs, please let us know. ** Assembly: Very little assembly is required. This furniture will be delivered in partially assembled sections. Assembly is quick and simple. **Accessories shown in picture are not included with the set. Please inquire if you are interested.